Even the far reaches of the galaxy cannot escape the iron grasp of the greatest Sith ever. Darth Vader, once a Jedi and still a powerful master of the force and excellent pilot, rules an empire and seeks to crush the rebellion all while trying to bring his family back together. Maybe he's just a little misunderstood then. He's made all this money and built a giant home for his family to live in and keep the business going only to have it destroyed (twice). Those spoiled brats just need a lesson in manners. But I guess that's also what you get for causing the death of their mother, running out on them, and separating them at birth. Alright, so maybe he is kind of a jerk, after all, but we still think he's a pretty cool guy with some awesome powers and skills! Also, he turns out alright in the end just before he dies. That is until his nephew decides he really had the right idea in mind. Now you can live your dream of ruling the galaxy, or at least looking as tall, dark, and mysterious as the guy who actually does! 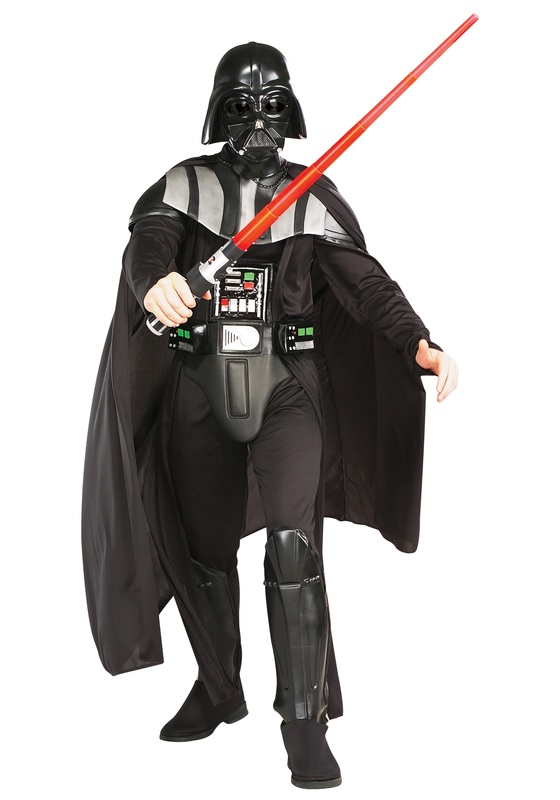 This deluxe Darth Vader costume comes with everything you need to be part of the galaxy this Halloween. The printed jumpsuit comes with an attached cape and polyfoam boot tops. Rubber armor and a belt are also included to add detail to the costume. Top it all off with the half Darth Vader mask. We say that you are welcome to try to tempt your kids over to the dark side as much as you want and even bribe them with cookies (it'd work on us), but please do not abandon them throughout their entire childhood and then decide that you need them back in your life to keep up with the shady business that you've been building all these years. It really only looks cool in the movies. We have a wide range of other Star Wars costumes as well so grab a bunch of friends for a fantastic party in the theme of the greatest Science Fiction series ever to grace the silver screen! I bought this for my myself and Darth Maul for my son for an event we're attending. Neither costume looks as good as the pictures. Darth Maul's mask details did not look as good or authentic as the picture and the overall quality of the costume is poor. The fabric on both costumes is very thin. My son's mask is thin is already cracked. I am not sure if this happened in shipping or in the 10 min he wore it while trying it on. The Darth Vader costume was the same deal with the mask and the chest/belt details didn't match the picture. I've purchased other similarly priced "deluxe" costumes from other retailers that were much better quality. Overall I can't recommend this retailer for another purchase.